Learning management system (LMS) software enables a business to host, deliver, and track job-related employee or customer training. LMS software administers employee courses and produces certificates and reports on participation, saving businesses time and money. We reviewed small business-appropriate LMS software vendors that are affordable, easy to set up and use. For LMS software that provides both off-the-shelf and custom content and also allows you to sell your business training programs online, consider our top recommendation, TalentLMS. Its affordable platform is free for small businesses with fewer than five users. We focused on LMS software that can be administered without a full-time trainer. We then narrowed it down to seven LMS vendors based on price, ease of setup and administration, and the ability to host both instructor-led and online courses. Further, we wanted to make sure the LMS software was easy for employees to use too. We recommend TalentLMS as the best overall learning management system for small business because it not only gives you free LMS software if you have fewer than five employees, but you can also host up to ten courses that you create yourself or purchase from their training content catalog to help you jump-start your employee training program. We recommend TalentLMS as the best overall learning management system for any business that wants to conduct employee training because of the low price, the number of courses included, and robust features. There’s also a free forever version if you have fewer than five employees/users. Even if you need a paid version, it’s cheaper than most of the other LMS systems out there, except Moodle (which is open source and free). Using TalentLMS, you can create your own learning content. The free version lets you create and host up to 10 courses or purchase courses from TalentLMS’ Course Marketplace of eLearning courses. Access to these courses saves you time because you don’t have to create content from scratch or search for, purchase, and upload training programs from external course providers. You can even sell courses to customers online through PayPal or Stripe with the ecommerce option. Other tools like Moodle also allow you to do this, but setting up payment systems isn’t as straightforward. The price of TalentLMS ranges from the free version to about $200 per month for up to 500 users. There are no setup fees. If you have fewer than five employees and need to host no more than 10 courses, you can keep the free version—no time limit! The pricing below shows limits on the number of active users at each price point. If you go over these limits, you’d only pay a $4 per user fee that month (for example, if you have seven users, you would pay $8 per month). TalentLMS provides additional plans that include features like custom reports and automation for larger employers with 101-1000 employees. In addition, the annual plans are cheaper. However, you can sign up for monthly billing if you need to spread your expenses over 12 months. You also have the option to try any plan before you buy without providing a credit card. And TalentLMS doesn’t charge for content storage, unlike some of the other LMS systems like SkyPrep and Skillsoft. Everything you need to host and track training is already built into TalentLMS, and very few of these features require you to upgrade to a pricier plan. For example, you can upload your employees via a CSV file and then let them choose their training through a learning portal. Courses, reports, and administration are all built in. And unlike Skillsoft, you can build and add your own custom courses at no additional cost. In addition to the standard LMS features, TalentLMS includes video conferencing, a training calendar, personal messages, and discussion forums for informal learning—allowing your employees to reach out to and learn from peers and experts. Their mobile app brings the training content to workers where they are—even when out on a job site. Customization with your company logo and single sign-on (SSO) for user authentication is also available. The only real features that may inspire you to upgrade to a more expensive plan are SSO, automation features, and customized reports. If you upgrade to the Plus plan, you’ll have a Success Manager assigned to your account. 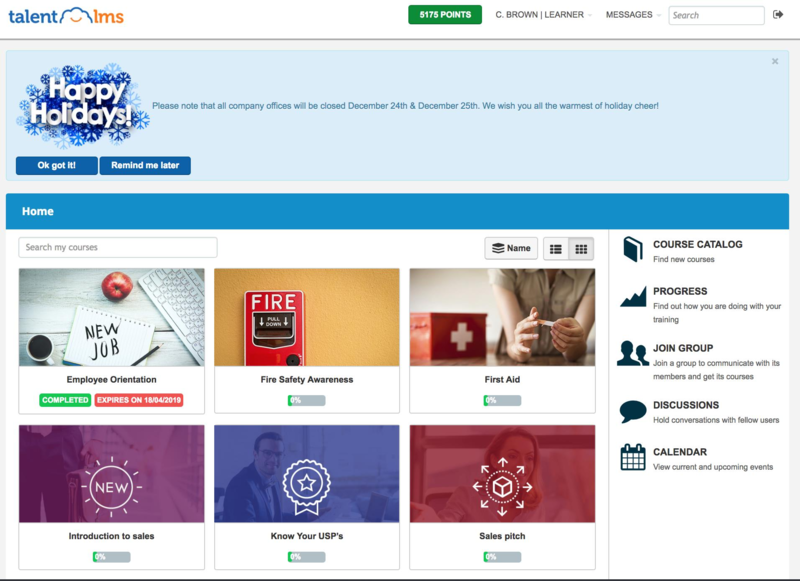 The TalentLMS Course Marketplace lets you purchase existing courses from a catalog to cover common training needs like sales, IT and safety skills. This saves you from having to create and upload your own courses. Or, you can build courses yourself for job-specific training relevant to your custom processes or workflow. For example, you could simplify your new hire process by presenting onboarding information online instead of one-on-one with each employee. If you already have training videos or pre-built PowerPoint presentations, those can be added to TalentLMS to keep all your employee training content in one place. In fact, TalentLMS found that 64 percent of new hires felt they became more productive faster when they were onboarded through blended learning methods. In addition to standard e-learning courses that employees can sign up for, TalentLMS provides training through video conference, surveys, and learning paths. For example, an employee might be assigned a blended learning path that includes an instructor-led training course combined with online discussion forums and shared presentation files. In addition, those businesses interested in selling their custom courses to customers can do so using the ecommerce features, such as selling individual classes or a workshop subscription via PayPal or Stripe. TalentLMS is easy to administer because you can easily upload your employee list via a CSV file and then assign employees to existing or custom courses. Each learner will have their own portal and a learning path. If you upgrade to the Plus plan which costs $199/month if paid annually, you can even obtain custom reports and automations that do things like assign employees to training based on a date, promotion, or job role change. Furthermore, its assessments allow you to test user skills with pre- and post-tests. Or, you might want to offer employees an option to test out content if they can demonstrate they already possess the requisite skills. 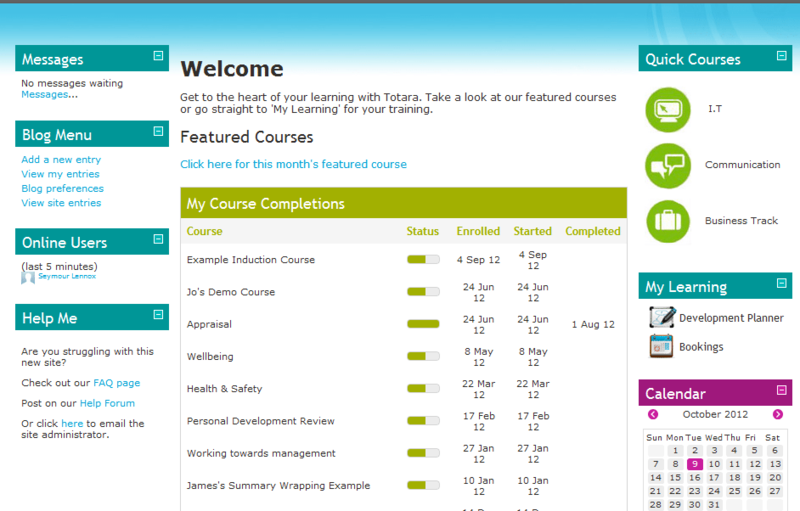 You can also use the learning paths to restrict how courses are accessed and completed. For example, you may not want a learner to skip ahead in a mandatory online course about preventing harassment at work. TalentLMS has native integrations with presentation tools like GoToMeeting and Zoom, communication tools like Slack, and CRM tools like Salesforce. You could also integrate with content on WordPress or connect to over 200 other software services through Zapier. For those looking to sell online courses, TalentLMS integrates with Shopify, and it allows you to create a website that can only be accessed by logged-in users. TalentLMS provides a blog and a knowledge base for users to find support as needed. Their how-to guides contain step-by-step instructions with screenshots, making them easy to follow. Otherwise, end users and administrators are required to submit a service request from the learning portal. Users of the Plus package will be provided with a dedicated Success Manager to help them get started and to assist with troubleshooting. Although TalentLMS is a great product, there’s no telephone support. If you want SSO, you have to upgrade to the Basic package. And if you want customized reports and automation, you’ll need to upgrade to the Plus package. Otherwise, it’s all there, even in the free version. TalentLMS gets mostly five out of five-star ratings on third-party software review sites, including ours. What users and administrators like best is how easy it is to set up and use. One of the features that makes TalentLMS our top recommendation for small businesses is that it already has hundreds of pre-built courses you can purchase. Uploading new or existing content can be done via Dropbox, and adding employees is done via CSV files. Thus, setup and administration are easy. And it’s free for those with fewer than five users. Click here to get started. We recommend Moodle as the best free learning management system for businesses with a bit of IT savvy. It is user supported and very popular (with over 70,000 customers and almost 90 million users). It has a robust community forum, a personalized dashboard, and includes some nice extra LMS features such as a calendar and user notifications. However, it requires the business to have some IT skills, as it’s a bit less intuitive to set up than TalentLMS. Moodle LMS is customizable and secure, and it is a great option if you’re a bit tech-savvy and don’t want to have to pay for LMS software. Moodle refers to itself as a content management system in addition to being an LMS. However, its content is typically learning-related rather than general content, like a WordPress blog site might host. No other free LMS comes close to Moodle with respect to features and popularity. However, that pricing comes with a trade-off—you may need to purchase courses (if you don’t like the free open-source ones available). Or, you may need to pay an IT resource to help you set it up and customize it if you can’t follow the user community’s technical instructions. *Pricing is in AUD. At the time of writing, $80 AUD is approximately $60 USD. If you don’t want to host Moodle yourself, they can help you set up a web-hosted solution for as low as $80 AUD per year. Because it’s been built with input from the user community, Moodle has great features—even if its interface looks less slick than the others. It is used by large industries and educators as well as small businesses. It has a wonderful resource center with answers on how to do just about anything LMS-related in Moodle. With Moodle, you either have to create your own courses using software like Microsoft PowerPoint, Articulate, or Captivate, or you need to upload free courses created by other users. The Moodle course authoring tools aren’t great. You can also find Moodle-compatible courses created by other vendors available for sale online. The problem here is that there’s no guarantee of the quality of user-generated courses. It’s a little like pulling your training content from YouTube. You may find a gem, or it may be a dud—, therefore, you, as the business owner or trainer, will likely need to preview any courses before you assign them to employees. 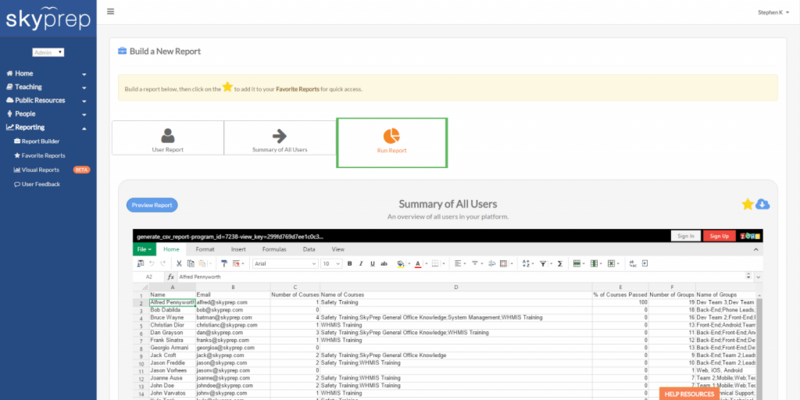 Administration with Moodle is going to be more difficult than with TalentLMS. That’s because it doesn’t come with its own back-end database. You have to upload your employee list to an SQL database such as MySQL, MariDB, or PostgreSQL and then integrate the data with Moodle. On the plus side, they have a mass data upload feature. Once you get your database setup, connecting it to Moodle isn’t that difficult for a database administrator to do. One reason so many training administrators like Moodle is that it can be customized. You can do everything on the administrative side, from sending automated email reminders to customizing your LMS portal for your learners. Moodle has over 1,500 plug-ins, from calendars to webinars, blogs, themes and content management systems. You can also integrate data using a flat file like a CSV format, or by using application program services (APIs) to connect data across platforms. 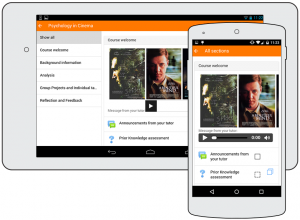 Moodle has recently launched Moodle Mobile. Expect more integrations in the future. Moodle supports over 100 languages with language packs that can be downloaded in a zip file and installed as part of your Moodle LMS software. That’s helpful if you have a multilingual workforce or work closely with international partners. Moodle provides no direct customer support other than through the user community and online resource center. They’re based in Australia, and you can send them an inquiry from their contact page. Some users choose to have Moodle host their site, and of course, in that case, they’ll provide support by phone or email. While Moodle is a powerful LMS, its course authoring options aren’t the best. In addition, Moodle doesn’t have a back-end database for your employee list, so you can’t just upload your list of employees who need training with a CSV or Excel file. Moodle also has no direct integration with any HR software or payroll system. And there is currently no built-in social learning component letting learners reach out to experts on social media. And, finally, if you want to sell courses on Moodle and process payments through PayPal, you’ll need to do some research on how to set up the code in the program. In other words, it’s possible to do so many things on Moodle, but not necessarily easy unless you’ve got programming skills. Moodle is rated a solid four out of five stars on most third-party review sites. There are a ton of user reviews reflective of the sheer number of Moodle users—educational institutions, small businesses, administrators and learners. For those who want complete customization and no ongoing charge for their LMS, Moodle is an excellent (and free) option. Using your existing IT and database-management skills, you can fashion Moodle into your own LMS platform with almost any feature you can imagine included. We recommend SkyPrep for businesses using the Google Suite (G Suite) of business applications because you can easily upload and import employee data into the LMS from Google Sheets. It’s also a bit higher priced than TalentLMS but offers a good user experience and an easy way to track compliance—although courses aren’t included in the price. Businesses that need to document their compliance training can do so by importing the relevant courses into SkyPrep and tracking completion. SkyPrep is easy to install. You import users from G Suite and upload your own courses, including videos and presentations, or import courses found elsewhere. Although they don’t have their own course catalog, they integrate with OpenSesame, where you can find and upload courses, many at no or low cost (OpenSesame courses can be imported into Moodle as well). Like the other LMS systems we reviewed, SkyPrep will encrypt sensitive data on any page. In addition, it supports eight languages (as compared to over 100 with Moodle), and like TalentLMS, gives your business the option to sell courses using PayPal or Stripe. SkyPrep’s pricing ranges from $79 to $649 based on the number of employees you need to train (when we contacted them, SkyPrep gave us a small business price of $79 for 25 users, although that price wasn’t posted on their website). That’s more than double the cost of TalentLMS. Both offer a free 30-day trial that doesn’t require you to use a credit card. 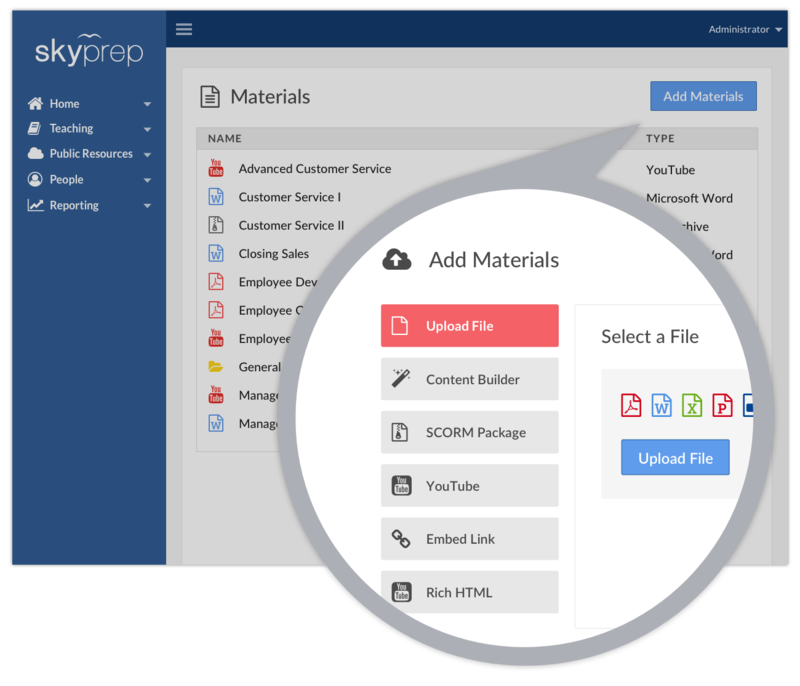 SkyPrep includes user access for a limited number of administrators—individuals who can assign courses, print reports, etc. If you want phone support, you’ll need to choose a package that includes it. Social learning is not included but is available as an additional service called BoostHQ Social Learning Platform, which costs between $0 and $49 month, plus $1 per user per month. SkyPrep offers many of the same features as TalentLMS, except that it doesn’t have its own course catalog. You can bulk upload your list of users. Typically, those are your employees who need training and your administrators who need to set up courses and assign which workers need to attend which lessons. You can also build courses, assign learners, provide learning paths and tracks, and give employees access to their own self-service page. SkyPrep offers the kind of features that most LMS’ offer, although some of the features, like SSO, require you to upgrade to the Premium package. It integrates with Google, Facebook, and many other social media systems. And like the other LMS software reviewed so far, it provides a mobile app so that employees can complete training and certification remotely. 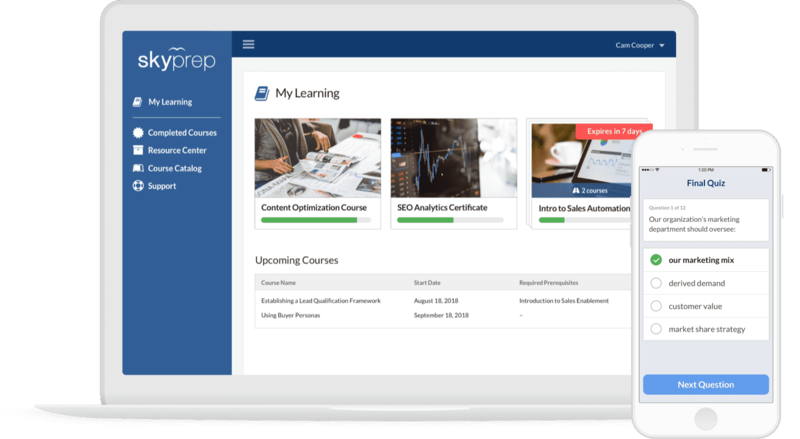 SkyPrep, like TalentLMS, has built-in course authoring so that you don’t have to purchase an authoring tool in order to create online training content. However, they don’t have off-the-shelf courses built in. Therefore, you’re starting with a blank slate. That may be fine if you’re upgrading from an existing system and have your own courses or have an instructional designer on staff. Otherwise, you’re going to have to find course content yourself and import it. Fortunately, free and low-cost e-learning courses are available through a third-party content provider, OpenSesame. In addition, you can set up the content into learning paths and learning tracks based on factors such as job title or work department. That’s helpful in industries, from nursing to restaurants to financial institutions, that need to verify that their workers have successfully completed required courses and certificates. Training content can be provided in multiple formats, such as print, video or e-learning modules. They also offer social learning through a feature called BoostHQ. Further, you can create surveys and quizzes and even have the software grade exams for you. Like all the LMS software we’ve covered so far, you can upload your users through a CSV bulk user upload function. Once set up, employees have a self-service option and you can set up learning paths and learning tracks in advance. You can also schedule automated email reminders so that employees don’t forget to attend pre-assigned courses. Employees can search for and sign up for courses based on their needs, making the learning self-directed and just-in-time. Basic reporting is available, but if you want advanced reporting, or want to track training by groups or by manager, you’ll need to upgrade to a more expensive package. At the lower pricing tiers, support is provided by email only. Once you upgrade to an Advanced or Premium plan, you’ll have access to phone support. SkyPrep has plenty of nice features and was a close runner-up to TalentLMS. However, there is a limit on data storage based on the package purchased. If you have a lot of courses or your courses have large video/media files, you might have to upgrade. It’s also much more expensive than either TalentLMS or Moodle. And although SkyPrep integrates with OpenSesame (free courses), they don’t have their own course catalog. Therefore, you may have to pay for content if the free courses don’t meet your needs. In order to get SSO, you’ll need to upgrade to the Premium package. SkyPrep earns a consistent five out of five-star ratings from both administrators and learners. Those managing a large volume of training courses (such as mid-size companies) find it’s worth the extra money for the administrative features and G Suite integration. If G Suite integration, an easy-to-use system, and compliance are your top priorities, SkyPrep is a good choice. And as you grow from 50 to 5,000 employees, the cost per user continues to go down from about $3 per month to closer to $1.50 per month per user. In addition to an LMS called Skillport, Skillsoft provides thousands of high-quality e-learning courses with video and animations to choose from, including certification courses and e-learning lessons in IT, HR and project management, among others. It’s best for businesses in all industries, and those that specifically want to develop leadership talent. However, it’s priced much higher than an LMS alone. There’s a reason 7,000 customers have chosen Skillsoft. I chose Skillsoft for one small employer that I worked with based on the top-notch catalog of courses that would have been very expensive to purchase separately. So, if you want to offer regular ongoing leadership, IT, HR or professional development training to your employees, Skillsoft is a good value. All packages provide custom branding similar to BizLibrary. Skillsoft pricing starts at $500 per month for 25 users and increases based on the number of users and the number and kind of courses you choose. That works out to about $20 per month per user, which is much higher than the other LMS software we’ve covered. Skillsoft is unique in that, if you purchase a package of 300 Skillsoft courses, you get the LMS and all the course tracking features that it comes with. Built-In Course Content 300 Courses Included 300 Courses + 100 Leadership Videos and Books Depends on how many and what kinds of courses chosen; lets you add your own course content. 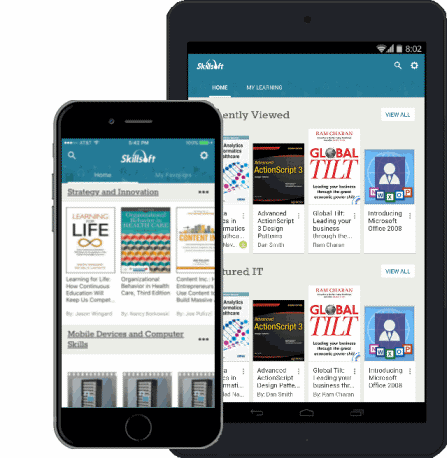 For example, the Select package lets you choose from 300 self-paced e-learning courses from Skillsoft’s business, IT, and project management catalogs. The Select Plus package adds leadership videos and e-books. Certification courses, like workplace safety or sexual harassment training, are also available from a different catalog at a different price. Skillsoft doesn’t offer a free package, but they do have a 14-day free trial if you want to check it out. The strength of Skillsoft is in the quality of course offerings. When you buy a package of courses, you get the LMS included. Like TalentLMS, it comes with built-in courses, however, TalentLMS has mere hundreds while Skillsoft has thousands of top-notch courses to choose from. That saves you from having to purchase expensive e-learning lessons, books and videos from third-party vendors. For no additional cost, you could also add ecommerce with an additional Channel Agreement or social learning with their InGenius add-on. If top-quality, professionally-designed e-learning courses are the feature you’re looking for in an LMS, then Skillsoft is likely the best choice. They also provide instructor-led training, books, and videos. Rather than having to pay for third-party management training, or reimburse travel expenses to send your trainees offsite, the course content is included with the LMS portal. Skillsoft training is primarily e-learning; it’s created as instructionally sound, self-paced learning modules assigned to an employee based on their individual learning plan. It also includes instructor-led sessions and a library of books and videos as well as courses. Skillsoft has social and collaborative learning like TalentLMS so that individuals can learn from their peers and the Skillsoft community at large. Skillsoft provides extensive administration options and, therefore, has a bit of a learning curve. In that way, it’s more like Moodle. It may mean you will need to choose a person, such as a manager or HR rep, to oversee the software implementation and answer trainees’ questions until they get the hang of it. Like the other LMS software we reviewed, once users sign up or are assigned to courses, you can set up automated email notification reminders. While you can upload your users by CSV file, you may need support from Skillsoft to choose your courses, set up the LMS software (Skillport), and configure it for your team. Skillsoft integrates with multiple larger applications like Workday and SuccessFactors. They also integrate with big IT vendors like Cisco and Oracle. During your implementation, they’ll work with you to best integrate the data you need with your existing business or HR software. Skillsoft provides administrative and user support 24/7 by phone, email, or live chat—which I have used and found to be very responsive. In addition, their online support comes complete with step-by-step instructions and screenshots. It’s customized for learners, administrators and IT support staff in a library-like structure that lets you search or drill down to find exactly the information you need. Skillsoft contains just about every course that a small business would ever need to be included with its LMS. But what’s missing is the ability to upload your own proprietary learning/e-learning courses, such as a product video or your new hire orientation program, without having to pay an additional hosting fee based on the amount of storage you use. Therefore, if you need custom content, TalentLMS or Moodle are better (and also less expensive) options. Also, the Select package does not include SSO or any HR Software integration. Like content hosting, those features require an upgrade to the more expensive Unique package. Further, unless top-quality training content is what you’re mostly after in an employee training platform, Skillsoft is much more expensive than any of the other LMS systems we’ve compared thus far. Skillsoft receives user ratings in the solid four to five out of five-star range. Users like how easy it is to use, administrators like the quality of training, and who doesn’t like live online chat support? Many businesses have moved away from managing expensive, instructor-led training to using Skillsoft’s e-learning platform and like the savings. To reduce expenses on external training content, workshop travel, e-learning courses, books and videos while developing your leadership team, Skillsoft has LMS software that packages the content and tracking of training all in one place. Meanwhile, their Skillport LMS software provides most of the features a small business would ever need. We included LearnLinq in our comparison as a rising star among LMS systems. While not as well-known as the others, it was designed specifically for small and mid-sized businesses. Although it’s pricier than TalentLMS, users give it great reviews for being quick to implement, easy to administer, and user-friendly for employees, with intuitive visual menu icons. It includes all the basic LMS features, and nearly all users in companies with fewer than 50 employees said they would recommend it. LearnLinq is based in Europe, with pricing in euros. The prices range from approximately $240 to $1,200 per month depending on the number of users. LearnLinq has a free 30-day trial, with no credit card required. All of the plans come with 50GB of storage space for hosting your online training content. LearnLinq includes all the requisite LMS features, including the ability to import users from Excel, create courses, upload content, provide learning paths, schedule training, and send reminders to trainees. LearnLinq has a modern look and feel and many users stated that LearnLinq is easy to use and fast to implement. It integrates with SAP, and has helpful online resources including text chat and video tutorials to help you get started. Training content can include video, images, hyperlinks, and testing. E-learning courses can be created with an easy-to-use content creation tool, easygenerator, or uploaded to your course catalog or library. You can also manage employee compliance training needs with LearnLinq’s Employee Compliance Management feature. That allows you to pre-schedule training based on job certification cycles. 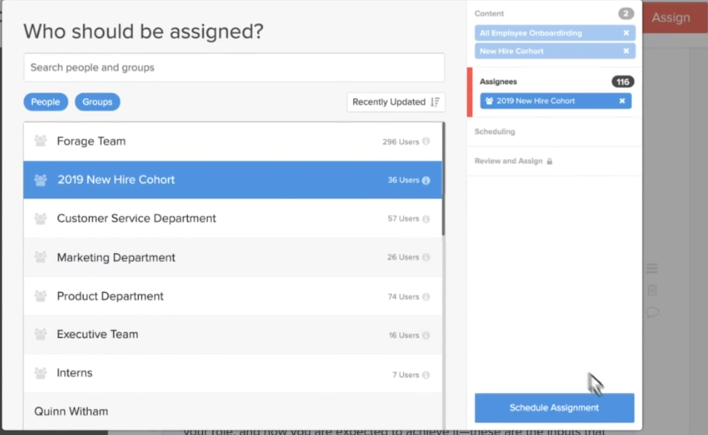 Learning paths allow you to create customized training plans for your employees. They can be set up by employee as well as by job function or even by work location. Employees can view their own learning path, and managers can verify that employees have completed the required training. Unlike Moodle, Skillsoft and BizLibrary, which can take up to a month to implement, you can set up and go live with LearnLinq in just a few days. The user interface, designed using Google’s design philosophy, provides dashboards based on job roles. That makes it easy for administrators to create courses, assign trainees and run reports. In fact, if you don’t want to administer it yourself, you can delegate that task to allow self-directed teams to manage their own training needs. LearnLinq can be set up to integrate with your existing HR systems so that your team data and organizational structure remain in sync. 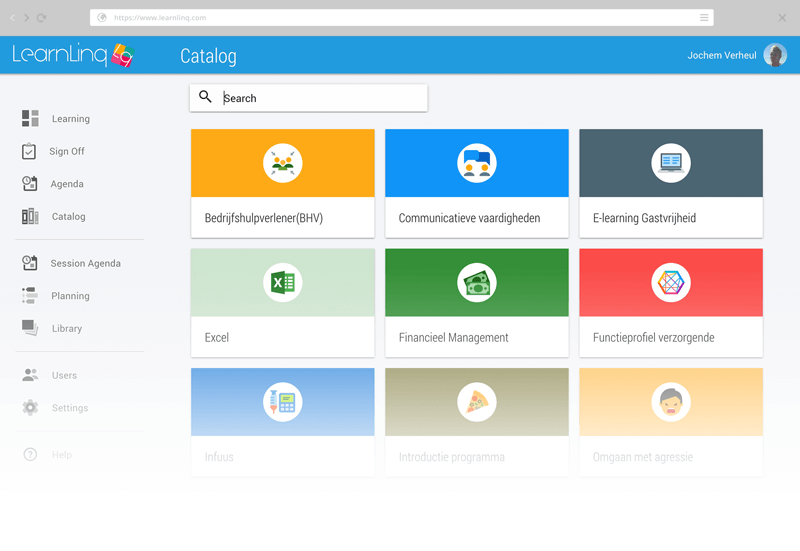 LearnLinq is based in the Netherlands and launched in 2017. Their user support is via the web and phone. The one drawback I found for U.S. business owners is LearnLinq’s sales and support is not currently 24/7, so I had to wait until the next business day for text chat and email responses. It doesn’t yet have robust reporting, video conference integration, or social learning, but these items are on their roadmap. While it supports U.S. clients, most of the reviews were from European users using LearnLinq for less than six months. They commented that some features are still in development. If you’re looking for a quick-to-implement, easy-to-use LMS, built using Google’s design aesthetic, LearnLinq has that cool factor. That increases the chance that your employees will actually use it. And for those without an instructional designer on staff—no worries. The course development tools are easy-to-use as you build your own custom content online. We recommend BizLibrary as best for businesses that need to provide a wide range of training topics to their employees. It offers some fresh learning tools in addition to its 7,000 courses covering eight major content areas like retail, IT/technology, and services, as examples. One of those tools is gamification. That allows learners to earn points and badges and compare their progress on leaderboards. As far as pricing goes, you’ll need to get a quote, but it’s going to be at the higher end (due to its inclusion of the course content), similar to Skillsoft. Further, it provides the standard content management option including micro-videos, e-learning and e-books along with an LMS that lets learners curate their training into a playlist structure that they can share with peers. It’s designed similar to Skillsoft in that it’s primarily a training content provider, but since it gives you an LMS to track that training, it’s worth including here. With BizLibrary, every quote is custom and is based on the number of employees you have as well as whether you need the LMS, the training content, or both. Like Skillsoft, their content is curated from quality sources. For a small company, it may cost between $125 and $160 per year per user, about the same as Skillsoft. In any case, that’s much higher than you’d pay for an LMS like TalentLMS. That’s because it includes an entire library of professional learning lessons, as well as a learning management system. 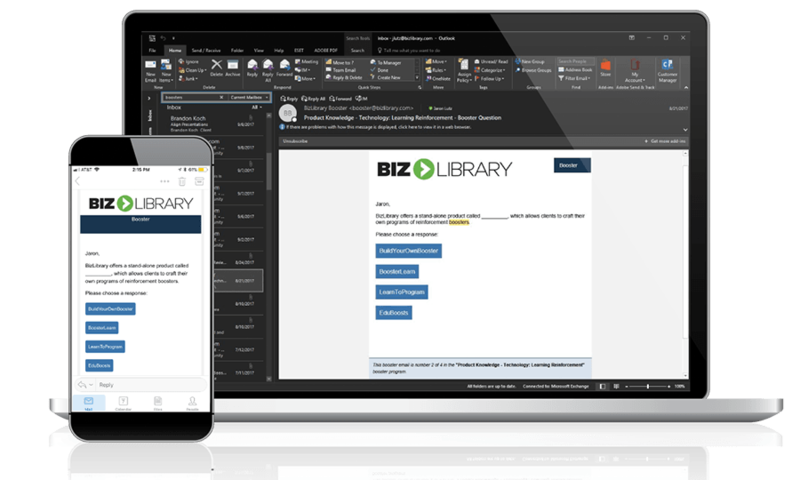 BizLibrary provides all the LMS software features a small business needs, including the ability to assign courses or allow users to register themselves. It offers email messages and reminders, document management (including your custom courses and videos) and the ability to schedule classroom-based training and certifications too. Thousands of courses are available in the content library. However, unlike Skillsoft, BizLibrary provides you with the option to upload and/or create your own content as well. That training can include e-learning, video, games, quizzes, surveys, webinars, social learning, and certificates. 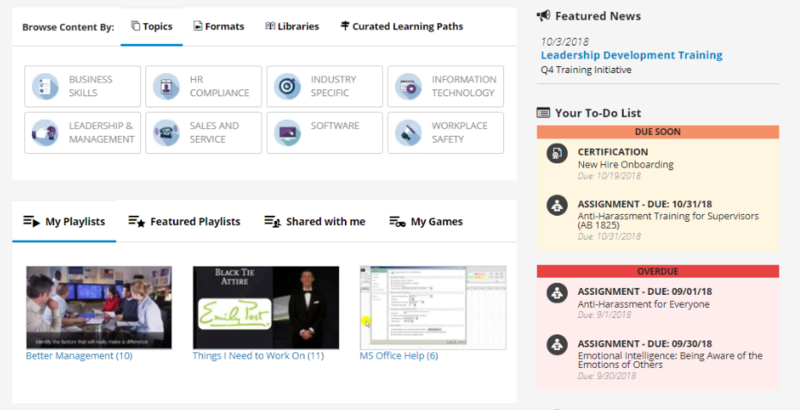 Like TalentLMS, you can add gamification to lessons within your learning management system as a way to incent your employees to attend and complete courses. You can also track employees’ points on a leaderboard and provide incentives based on their achievements. Once you decide to work with BizLibrary, you’ll be assigned a Client Success resource and have the support of a technical team to help you configure your system. However, being a larger, more established tool, BizLibrary takes about 30 days to set up and master on the administrative side. Once set up, though, it’s easy for employees to find and enroll in the courses they need. BizLibrary can help you sync your HR data to their system to ensure that as new employees are hired, they’re automatically set up in BizLibrary. Like Skillsoft, BizLibrary provides customer support via phone and email. They also give you a separate contact number and email to get help from the technical support team. Otherwise, you can send a request for information or support directly from their website using an online form. BizLibrary, like Skillsoft’s Skillport, can take up to a month to set up for your business. In addition, it’s pricing isn’t available online. Because it’s more than an LMS, it costs more as well. And some users complain that it’s a bit difficult to administer and obtain the reporting data they need. BizLibrary earns between three and five stars of five-star reviews on third-party websites but seems to have more variability in their reviews than the other LMS tools we evaluated. What clients tend to praise most is the customer service and technical support they receive. What users don’t love is the user interface and complex navigation, especially for employees who aren’t very tech savvy. For businesses that have a variety of training needs, from IT skills to safety and compliance, BizLibrary provides an LMS and includes with it thousands of high-quality online and video-based courses curated from top training providers. That allows you to save money on outside training and travel expenses while tracking all your various employee training needs in one system. Lessonly is best for businesses that need to train their employees on selling and customer service skills because after providing training lessons, it allows learners to practice their skills on camera and get feedback. Price-wise, it runs about $10 per month per user, which is about half the cost of Skillsoft and BizLibrary, but much higher than TalentLMS in comparison. Like the other LMS software above, it supports multiple types of content and contains a learning library. Like other LMS software that includes training content options, Lessonly doesn’t provide its prices online. However, we obtained pricing information from third-party websites that show it may cost between $300 and $1,250 per month or more based on the number of users. In addition, Lessonly has an onboarding fee to cover setup expenses. In addition, you can add on coaching, which allows you to provide learners with screen recording, tracking of live training, and responses via webcam. They also have add-on services for advanced reporting and software integration. 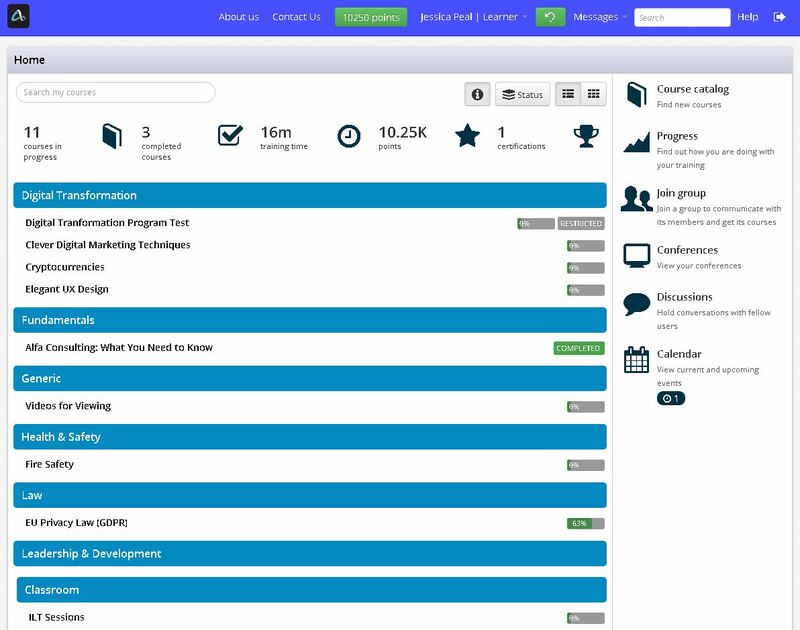 Lessonly allows you to offer employee training that’s easy to use and engaging for learners. It focuses on giving learners feedback through video practice and allows you to base training lessons on the learner’s work processes. 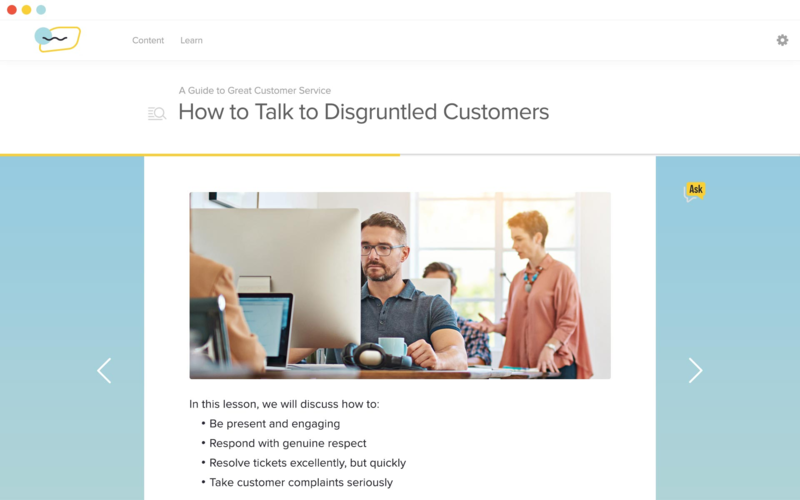 For example, if a CSR has trouble dealing with an angry customer, they can launch a training course on that topic right from their CRM system. Lessonly’s strength is that it has an easy-to-use, built-in tool that allows you to create your own courses tied to the specific needs of your workforce. You can set up in-person training, create lessons and build learning paths. And they provide what’s called Lessonly University, which contains templates and pre-built content from their learning hub. Your courses can include webcam recordings, screen demos, practice sessions using online chat, and feedback scenarios. It also helps team members craft emails, handle customer support issues and practice their sales pitch. Using video practice, your team members can rehearse their new skills on camera and then receive feedback from their manager or trainer. This helps them fast-track their sales and customer service skills development. The administration features with Lessonly are intuitive, not unlike TalentLMS. They don’t require you to have a dedicated administrator or technical support resource on staff like you might need with LMS tools build to support content libraries like Skillsoft and BizLibrary. In addition, SSO makes it easy for your employees to access without having to remember yet another password. Lessonly integrates with CRM tools like Salesforce and support tools like Zendesk. It also syncs with Google Chrome. Employees don’t even need to change windows to access the training they need. In addition, to streamline the onboarding process, you can integrate Lessonly with your HR tools like Namely, Zenefits or BambooHR. It even integrates with Slack and has open API and webhooks if you need to share data with your other business software. Lessonly provides customer support via live chat during business hours. In addition, they have email and phone support, similar to BizLibrary and Skillsoft. Lessonly lacks a testing environment and doesn’t yet provide robust reporting tools to evaluate business-specific training metrics. Lessonly, like TalentLMS, earns solid five out of five-star reviews on third-party software review sites. Users like how intuitive and user-friendly it is, and how easy it is to create and modify training courses. Few had complaints other than recommended improvements in the way data like dashboards, user progress reports, or course scores are shown. 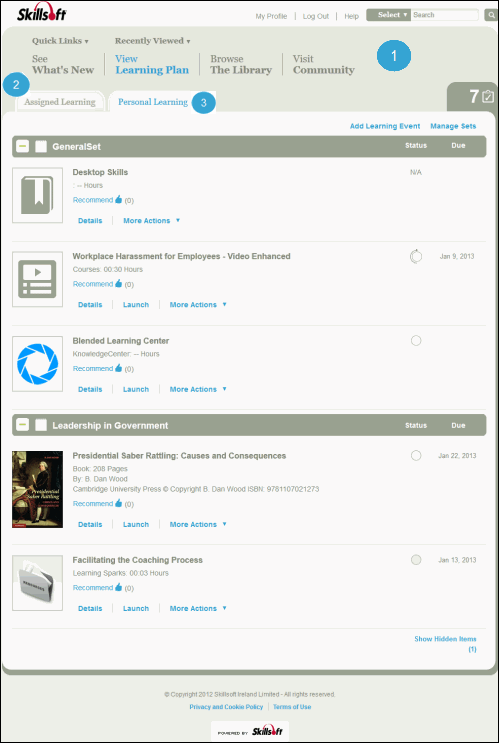 Lessonly makes it easy to build your own courses and then assign them to employees and track progress. With rave reviews on the customer service, easy-to-use tools, and a progressive roadmap, Lessonly is worth a look. Paycor Businesses that want HR and payroll at half the cost of ADP—plus an LMS. Udemy Best for content learners can access on their own for as low as $10 a class. Adobe Captivate Best for developing professional online training content; integrates with Adobe Captivate Prime LMS. Brightwood Best online training for real estate agents (formerly Kaplan). SalesPro Best for sales training with videos, lessons, quizzes and certificates. Ed2go Best online training option for bookkeepers and accountants. GP Straegies The best option for leadership training & development content. Thinkific Best for creating and selling your own online content via ecommerce. LearnDash Best for creating and hosting your online training on a WordPress site. Have a question about choosing the right LMS software for your business? Our analysts are standing by to answer! Ultimately, the LMS you choose depends on your business needs—do you need custom content, cloud-based hosting, or a simple way to ensure annual training is done? For the value and the features, TalentLMS is our favorite learning management system. But if you have programming capability, you might find Moodle to be a great free solution that meets all your small business training needs. Or, one of the other LMS or training providers may serve you best. 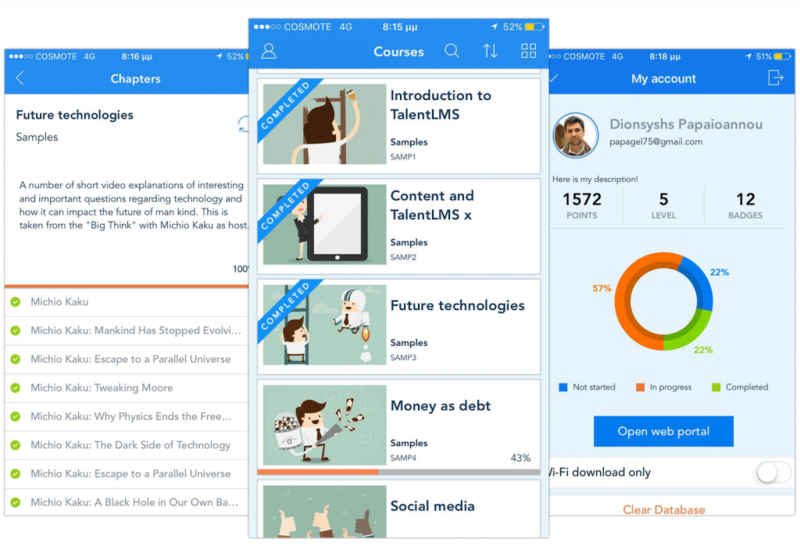 We recommend TalentLMS as the best overall learning management for small business due to their intuitive interface, easy-to-implement LMS software, existing course catalog and the ability for you to create fun learning experiences that include quizzes and gamification. Plus it’s free for up to 5 users. Click here to get started. Once you select one, drop us a comment. We’d love to know which LMS you chose and why.